The Calculator is one of the most exciting modules in the PlatformOne™ suite. It’s an extensible framework into which you can plug in modules that handle almost any kind of mathematical calculation, as long as it can conform to a simple COM interface. Perhaps the best way to illustrate the power of this is to consider a case study. a global composite currency derivative covering the world’s top 20 economies, representing the vast majority of global production. The WOCU is derived by weighting each of the twenty currency rates according to a formula determined by the WDX Institute (there’s more on how it all works here). The resulting composite rate is then made available as a series of cross-rates via a Marketlink feed and over the web. 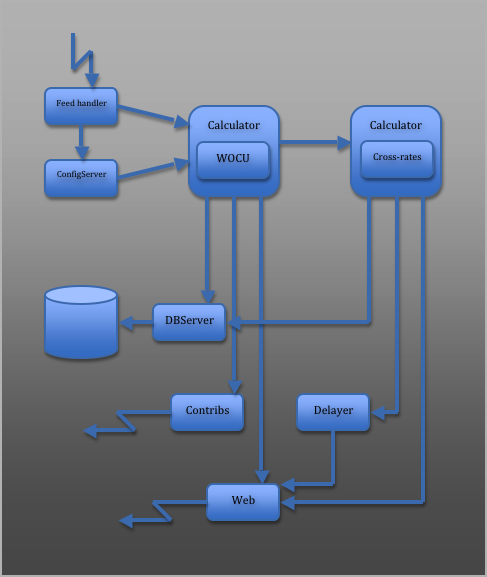 The raw rates for the individual currencies are captured from a data feed and then fed into the WOCU calculation along with the current weightings (which are provided by a custom application that we put together specially for WOCU that makes it possible to schedule updates to the weightings in advance without stopping the system). The results are then saved to a database (via the PlatformOne™ Database Server) and published to Marketlink (via the PlatformOne™ Contribution System) and the WOCU website (via an app based on the PlatformOne™ Java API). The base WOCU rate is fed into the cross-rate calculation, the results of which are also saved to the database and published to the web after a slight delay.